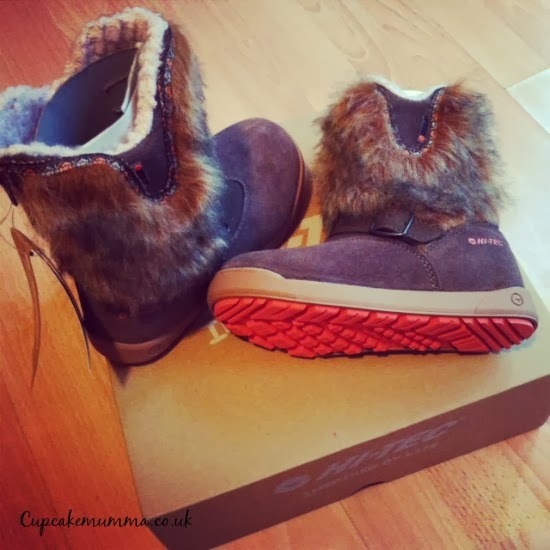 I've been sent some rather wonderful and warm looking boots to review by Hi-Tec (I say I've been sent them but of course I mean Midge has) Before I let Midge run off to school and mess about putting these boots to the test, I wanted to give you a bit of a first impression post! I'm going to start by saying I've never seen my daughter so excited by a pair of shoes. But they look very stylish and very comfy. So nice,I kind of wish they were mine and not hers! So, first impressions? The colour is very nice, I'm pleased to see a zipped back on the boots because Midge struggles to sometimes push her feet into these types of footwear due to the inheritance of 'pasty' feet. Most boots we try on for her she can never get her heel in, let alone her whole foot the poor thing! I'm not keen on the fur but that's a personal opinion and one Midge certainly doesn't agree with if stroking the boot was anything to go by. The inside of the boots are soft and seem like they will be very snug in this cold weather. Now we just need to put them to the test and see how well they fair on our cold and wet days out. Look out for our full review soon!